Another NIR DEMU vehicle has succumbed to the cutter’s torch. 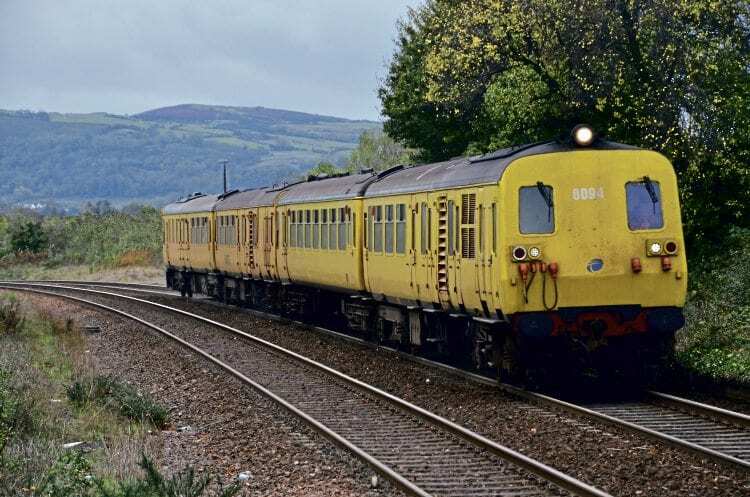 THE number of DEMU vehicles on Northern Ireland Railways’ books has once again been reduced, with the scrapping of Motor Coach No. 8094 on March 11.
by No. 8090 prior to the start of the 2015 season. Ahoghill-based metal recycling company Thomas Hamill was again contracted to carry out the scrapping, and No. 8094 was cut in two prior to its transfer by road to the company’s premises for final disposal. No. 8094, as No. 94, entered traffic during April 1978 – being one of the second phase of 80 Class vehicles ordered by NIR from BREL. When NIR adopted a sectorisation policy in 1987, No. (80)94 was included in the pool of ‘Intercity’ DEMU vehicles and subsequently named Glenariff. In its final days in regular passenger service, it was part of the four-car unit that formed the Modern Railway Society of Ireland (MRSI) ‘Class 80 Finale – The Last Thump’ farewell railtour on September 25, 2011. With the loss of No. 8094, only five of the DEMU fleet remain on NIR’s books: Motor Coaches Nos. 8069 and 8090, non-powered Motor Coach ‘Sandite’ application vehicle No. 8097, and trailers Nos. 8749 and 8752. The heritage Downpatrick and County Down Railway plans to preserve a number of the vehicles when they are released by NIR.